Summary: An interview with Tanya Lindquist, author of Duke’s Journey of Courage and the creator of the website familyninjas.com. Learn more about her background and the story beind her book. This post contains affiliate links. Please click here to read our disclosure policy. Duke, the great surfing dog known for his special tricks and flips, gets a stomach ache right before his first surfing competition. Luckily, his quirky fairy dogfather comes to the rescue and teaches him skills he can use to cope with anxiety. This children’s picture book is complete with memorable jingles to remember the skills by, as well as a parent’s guide with several tips and thoughts on how to talk to children about the different anxiety coping skills discussed in the book. As a therapist, I’ve counseled many different children who struggle with anxiety in one form or another. When I was a child I also struggled with severe anxiety. I remember hiding behind tires on the playground because I was so painfully shy. So, teaching coping skills to kids and watching their growth has become one of my passions. One activity that can be really helpful in therapy is reading books together. Many times we are able to relate to the characters in books and learn with them as they go on their adventures. Through books, many of my clients were able to find messages or analogies to better remember some skills to cope with anxiety. I noticed that many books we read were either really cute but only offered one skill or analogy or else were helpful to clients but pretty boring. So, I decided to merge my childhood goal of becoming an author and my education as a therapist and write a children’s book that is (hopefully) both entertaining as well as offers several different skills that kids can try at home. Duke’s fairy dogfather is quirky and silly and he takes Duke on a journey where he learns skills to cope with anxiety at every stop. Many of the skills that his fairy dogfather teaches are tweaked and made better by kids that I’ve worked with in therapy sessions. I learn from them and am grateful for the opportunity to work with kids who show so much strength and bravery. 2. Who is the book for? This book is written for children ages 6 and up. It’s my hope that children can read it with their parents, teachers, or counselors and work on all the coping skills the fairy dogfather teaches. Every skill has a slogan or jingle to remember the skill by. At the end of the book I’ve included a parent’s or caregiver’s guide to give additional tips and resources to help kids on their own journey of courage. 3. What is a journey of courage? Often kids, and I think adults too, believe that courage means the absence of fear or anxiety but that isn’t true at all. I often like to tell kids that you don’t need courage when you eat ice cream because ice cream isn’t scary! Instead, we have courage when we feel nervous or anxious about something and take steps to face those fears anyway. For example, kids can have courage when they talk to someone new, go to school even though they are feeling nervous, or perform in a play. 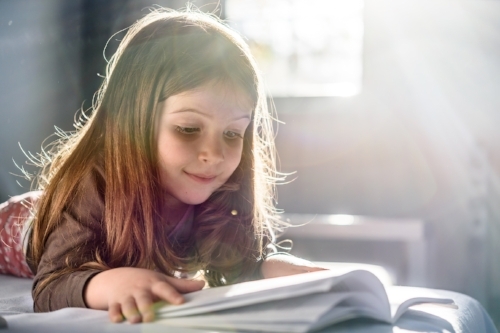 Just like the brave heroes and heroines get help from their sidekicks and fairy godparents in movies and books, kids sometimes can use a few extra coping skills in their own journey of courage as well. Every time they face their fears and anxieties they are showing tremendous courage! I am always amazed at their bravery! You can buy it for $15.99 at all major book retailers, such as Amazon and Barnes & Noble. It’s available for 20% off at our publisher’s site, lulu.com. You can also buy a print-at-home and/or read-online pdf for only $4.50! Newer PostThe Mom Conference 2018 is happening next week!